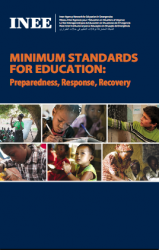 This document provides guidance for minimum standards in ensuring education in emergencies. The International Network for Education in Emergencies (INEE) Minimum Standards Handbook contains 19 standards, each with accompanying key actions and guidance notes. The handbook aims to enhance the quality of educational preparedness, response and recovery, increase access to safe and relevant learning opportunities and ensure accountability in providing these services.